This week I sat in on a Microsoft Partner Network 101: New Marketing Tools and Resources Webinar led by Chinmayi Bhavanishankar & Diana Emleila Ishak both awesome marketers to follow on LinkedIn and on Twitter. They are part of Microsoft US OCP, which stands for Microsoft One Commercial Partner. I find that things change so often in tech and with Microsoft that it is good to dip into these calls every once in a while. 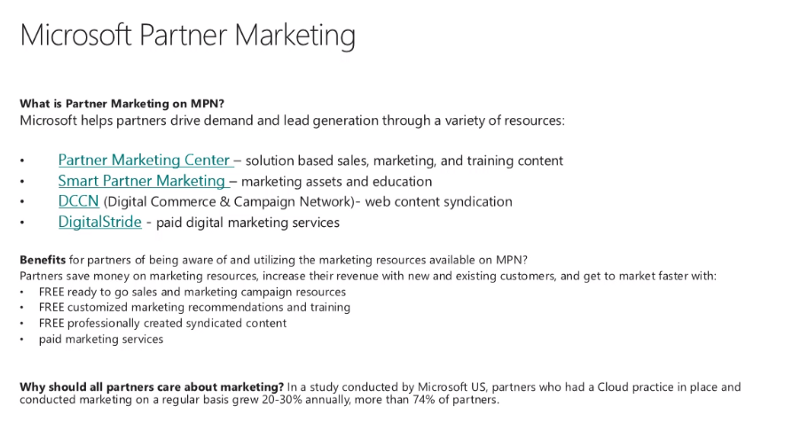 I find out about these webinars because of being part of the Microsoft US Partner Yammer Community. If you are a Microsoft partner and haven’t been to one of these webinars, you should ask to join the Yammer network above and look for these webinars. Look for “The Leading Edge — Wednesday Webinar Series” from this team. Leverage, reuse, and stop recreating the wheel for your marketing efforts. If you are a Microsoft Partner and your marketing team is not up on all of what Microsoft offers to partners around marketing you are doing yourself a disservice. There are so many templates, classes, workshops that are free to partners. This is a great way to bring a team together and train together, make the learning into a “book club” and take advantage of all the time and energy that has already been put into thinking through building marketing plans. Schedule time for learning and be selfish protecting that time. When do you take time to learn? Block 1 hour a week for learning, maybe this community can be a place to gain more knowledge and then push these ideas out to your team. Diana noted her hour a week for her learning in the webinar and I do this as well. It is so important to be a little selfish and take time to be #alwayslearning. What was in this webinar? Hope that helps and happy marketing! Want more Maven Moments? Once a month we share where to find Heather in the world and the most “maven/expert” opinions on marketing, brand, travel, and culture that we like from the internet. Receive our next issue by signing up here. Newer PostWhat's Your Story Morning Glory - How Do You Start Your Day? Older PostGet LinkedIn Legit - Are You For Real?